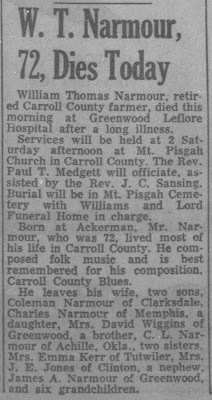 Coleman Narmour of Carrollton recounts this story his father, fiddler Willie T. Narmour, told him about the origin of his enduring hit tune, "Carroll County Blues: "
"He said he was leaving Leflore one fall. He'd taken a wagonload of cotton to the gin that morning. You'd have to wait your turn in line, so between sundown and dark his cotton had been ginned, and he and his mules were heading on back home. A little black boy was sitting on a train depot with a jew’s harp, trying to mock a train. From that, he got the tune and got to fiddling the next day on the 'Carroll County Blues." 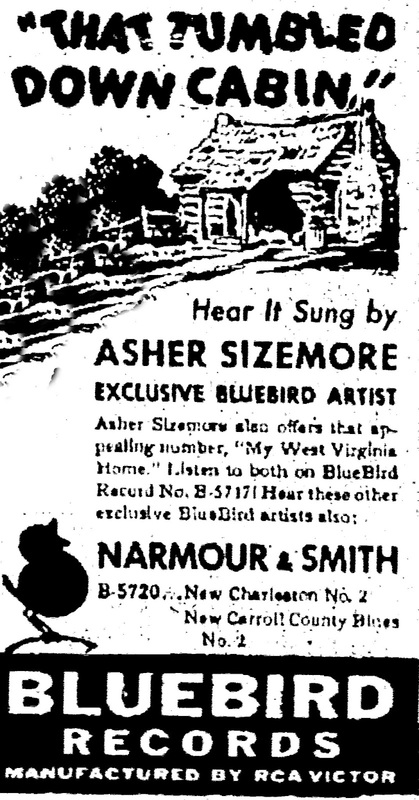 Willie Narmour and his partner, Shell Smith, recorded the song in 1929 and went on to make a slew of other records before the Depression nearly squeezed life out of the recording industry and then changing times altered the quality and tastes of it. "Carroll County Blues" became a legend and was subsequently recorded by many other musicians. Regionally at least, it's in live repertoires, a rousing hillbilly, then redneck standard. Yet Narmour's daughter, Hazel Wiggins of near Holcomb, will say quickly and decisively, "Nobody else can play 'Carroll County Blues.' And there wasn't a 'Carroll County Blues' until they went to the studio and recorded it." 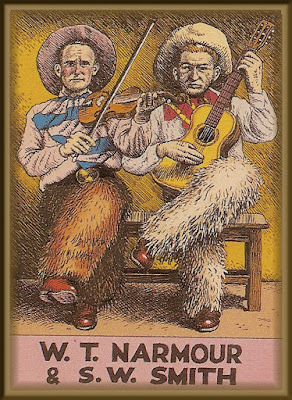 Smith and Narmour, buddies, dirt poor fanners, played guitar and fiddled for country dances. They were a county item long before they were discovered by scouts from Okeh Records at a fiddling contest at Winona in 1927. Such contests, Wiggins recalls, "Daddy always won, until they wouldn't let him enter anymore." Neither wanted to go on tour. While stories of how they entertained their fellow passengers during train trips to recording sessions regaled their families and friends, the truth is, Narmour and Smith were home boys. Narmour's daughter shared memories of her father working out tunes, for which he and Smith had no names and which they couldn't commit to paper, because neither could read nor write music. Names of these nostalgic tunes were created simply because there had to be titles for the record labels. Titles, such as "Captain George Has Your Money Come," "Where the Southern Crosses the Dog", "Sweet Milk & Peaches Breakdown," "Winona Echoes Waltz" and 'Who's Been Giving You Corn?' were products of discussions between the recording people and the artists "on the spot", Wiggins said. 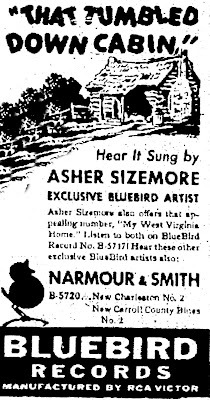 Several tunes bear the root, “Charleston,” referring not to the type of tune, but to a town in neighboring Tallahatchie County, and "Carroll County Blues" came because Narmour and Smith thought it appropriate to name one of the tunes for where they lived. To Carroll Countians, Narmour and Smith were true, and at home their fame never waned. 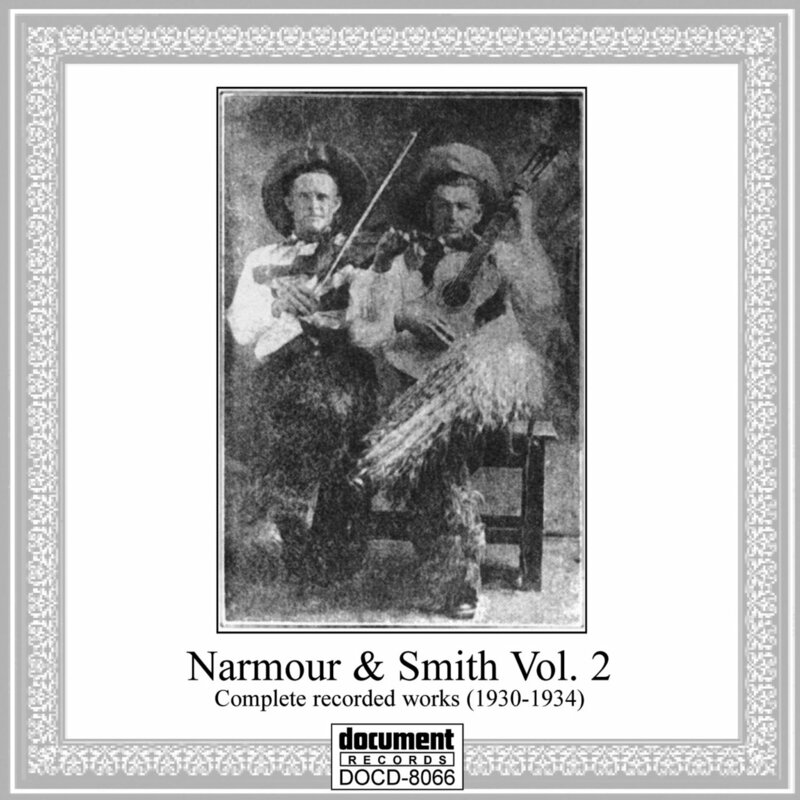 It would be the connoisseurs and the record collectors in decades to come, however, who would rediscover the old Narmour and Smith recordings and assure their niche in American music history. “Carroll County Blues" became a legend and was subsequently recorded by many other musicians. Regionally at least, it's in live repertoires, a rousing redneck standard. Among those are Joe Bussard of Frederick, Md., whose 25,000-piece collection includes most of the N&S records as well as early records by the partners' neighbor, John Hurt, who became internationally known after a blues historian named Tom Hoskins found him in 1963. In 1963, it was too late for Narmour's second chance. He had a minor stroke in the mid-1950s and a massive stroke killed him March 24, 1961. He was born March 22, 1889. During his exploratory trip into Mississippi in the 1960s Hoskins spoke with Smith, who had been working as custodian at nearby Valley High School, a country school that closed in the late 1960s. It was also too late for Smith, whose "boom-chang" guitar underscores his and Narmour's now-precious recordings. Smith, born Nov. 26, 1895, died Aug. 28, 1968. Their graves are marked by modest headstones in cemeteries along the road from Valley. 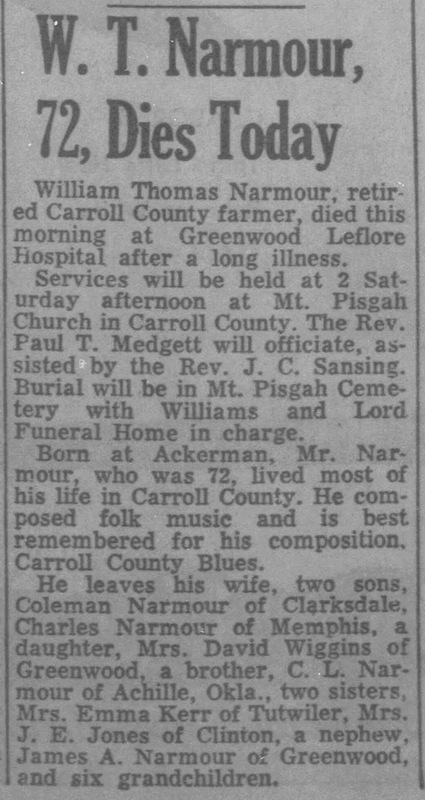 Narmour, whose day to day work included driving a school bus, farming, and in the 1930s, running a mechanic's garage at Avalon, is buried in the Pisgah Cemetery alongside his widow, Velma Carroll Narmour, who died in 1978. Smith is buried in Moore's Memorial Cemetery behind Pisgah Church. His widow, Lillian Kirby, died April 17, 1985, and is buried next to him. Narmour's last job was on the District 2 road crew. In Carroll County Miss., of course. Hurt, who died in 1966, is buried in a wooded glade along the edge of Valley Hill, overlooking Avalon. The cemetery was associated with St. James Church No.1, and people are still being buried there. 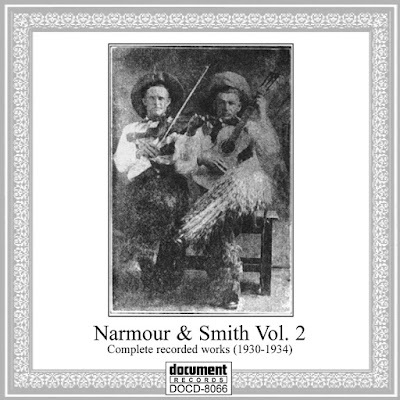 Born poor, Narmour (pronounced similarly to "armor") and Smith died poor and played out their lives true to the bone among the people for whom they played at socials and picnics and especially, the country dances which prevailed as primary entertainment. They had little formal education and couldn't read music. The inability to read music meant they couldn't write the compositions down, preserving them in that manner for the ages. Among their own, they long had validation. Purists keep the faith around the globe now. 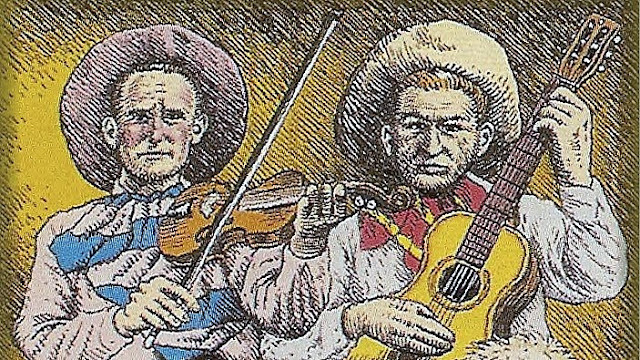 A reviewer writing in the Spring 1996 edition of “Old Time Herald” about a recent release in England which included selections from N&S, described Smith's style as "steamroller" and promised listeners they would soon fall in love with this old time music. 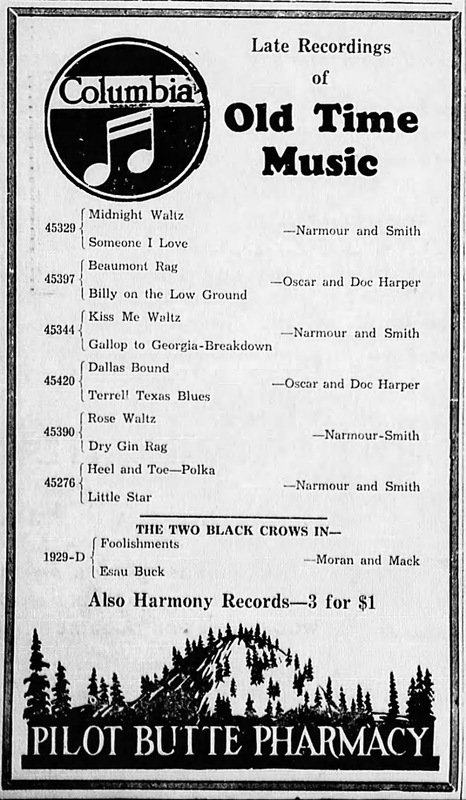 Descendants of the pair wish N&S recordings were more accessible to a new generation that has had the opportunity to hear works by black blues artists such as Hurt and Robert Johnson through, for example, high-powered record companies like Sony. The same promotion, however, doesn't seem immediate for the white country pioneers, such as the Carroll County duo. Steve LaVere, a music historian, points out that the more people e are exposed to N & S, the greater the demand for their records — no matter the quality. He disputed some latter-day critics, who describe Narmour and Smith as having a "bluesy sound." LaVere said, "No, I’d call it old-fashioned country fiddling, along with Smith's guitar 'Carroll County Blues' especially had a tune that was quite infectious, and even the waltzes were lilting, attractive. They played totally and entirely by feel, not how it 'should' be played." This philosophy plays true to the folk-lore, the "way it was" for these old-time fiddlers and their neighbors. "If you had a strong enough house, you could have a good 'stomp' there," said Coleman Narmour, Willie's son, who lives in Itta Bena. Country dances were routinely held in rural Mississippi prior to World War H, especially. "I tagged along a lot myself, whether or not Daddy was playing." Narmour, 73 at the time of the interview in 1997, at age 18 left the county his father and Shell Smith fiddled and picked into legend 70 years earlier, but Carroll County stayed in his blood. "You worked hard in those days," he said, "you plowed with a middle-buster. We didn't have no jet planes. We got T Models and A Models and didn't have no roads to put those on. Now you zoom through Carroll County 70 miles an hour. I used to ride a horse from Valley to Carrollton to the gristmill." Arnie Watson, nearly 90 and uncle of U.S. Sen.Trent Lott, says 1930s Carroll County was a wild place, and in the Val-ley area, where Watson partly grew up, "there was a bootlegger in every hollow"
Harmon Mullins, in his 90s, recalls he "went around with 'ern (Narmour and Smith) some. I couldn't dance. rd get drunk They were supposed to get a lot of money and got messed out of it some way. I've heard people try to play 'Carroll County Blues', but nobody could do it like they could." Keith Worrell of Greenwood grew up in the 1950s and 1960s at Valley, where his father was school principal. Worrell, a musician and radio engineer, well remem-bers Smith especially and endorses restoration or digitalization of the old recordings. Smith, he said, was "a man of few words, but his wife was my best pal." Worrell also endorses establishing a memorial to these musicians, largely unsung, who lived and modestly practiced their craft within a few miles of each other at Valley. Watson recalled, "You could stand out at the end of a field on the old Narmour place and look out across Avalon. Willie and Shell played at an all-night party on my 21st birthday, and John Hurt 'spelled' them. The cultures, black and white, did-n't mix, but John Hurt had his style, and they had theirs. Shell and Willie were just country boys; they went to New York and put those songs out, but continued to stay home, play for country dances, and make crops." For making the records, Watson says, the story is they "got $350 – and that's all they ever got." Collector Bussard, who offers tapes from records in his collection from his home at 6610 Cherry Hill Drive, Frederick, Maryland 21702, telephone 301-662-6666, says a Narmour and Smith recording "in mint condition is worth from $100-$200, maybe more." Musicians of their time, he said, were paid about $50 per side per record, and few got royalties. Laura Oakes of Greenwood, Narmour's granddaughter, has one of the N&S records, an Okeh. She recalls going to a blues festival in Clarksdale, where one of the performers, "Philadelphia" Jerry Ricks, embraced her appreciatively after learning her grandfather's identity. Narmour left Mrs. Oakes' brother, Chip Narmour, also of Greenwood, one of his battered, long-played fiddles, and her young daughter, Anna Kathryn Oakes, dances kinetically to both the black blues recordings brought home by her father, Richard Oakes, and to bootleg tapes of her great-grandfather's music. Wiggins said, "When Daddy did 'Carroll County Blues,' he did it all in his head, like with my math problems, but he couldn't write it down on paper. "He got to whistling what he could hear in his head and call me, Sis, listen to me, what I am playing, and had me whistle while he worked it. I'd say, 'Why, that's pretty, what is it? He said, don't know, Sis, but we're going to find out. Set here and whistle and fill in.'" Wiggins, 79 at the time of the interview, describes her father as a small man, about 5 feet, 5 inches tall, with deep blue eyes and curly black hair "He was a Frenchman, you know," she said. His personality, she says, was as engaging as his fiddle play. This claim is backed up by people who knew him, like Arnie Watson. "Have you swept around your door?" he'd say to people who'd criticize others, Wiggins said. He wasn't typically religious, but he'd attend church at nearby Pisgah occasionally. His father, John Narmour, was also a fiddler, who made Narmour learn on an instrument made out of a cigar box before getting his son a real one. Frequent musical evenings also provided an excuse, or outlet, for music when Wiggins was growing up. "Uncle Henry (Narmour) could also play fiddle, or he'd beat straws, we called it. It wasn't really straws, but perhaps drumsticks in time, or play bass fiddle. Oh, Aunt Jimmie could sing! Uncle Henry'd get up and buck dance up a storm. Now, they call it 'clogging', but it's the same thing." Others can't recreate "Carroll County Blues" as her father created it and played it with Shell Smith. "I've heard 'em try," she allowed. The late Grover Duke, whose grave is also in the old Pisgah Cemetery, could "play it as well as anyone else could," she said. Duke's widow, Sue Duke, born in 1947, married her father's good friend after her first marriage failed. She has had her own band for decades, playing keyboard and piano. She first heard "Carroll County Blues" at age 3, on her great-grandfather Hamp Corder's front porch. Duke was playing it on the guitar. She explains what she considers the basic difference between the original and more modern versions of the famous corn-position. "What people are doing is adding more bars to a measure on the turn-around, when another verse is to be done," she explained. Duke follows latter traditions and routinely produces rousing versions when the song is requested, which is often. Even if she and others think their interpretations work better musically, truth is, she says, to do "Carroll County Blues" exactly as Narmour and Smith did, an artist has to be able to "hear" the subtle nuances. No can do, Duke admits. It's a piece of history, that song, above all the other hits Narmour and Smith produced. It's a standard, a rousing, redneck standard claimed on occasion by Carroll Countians from other states whose make-up includes a Carroll County – but isn't the right Carroll County. Just to set the record straight. I had understood that SHel Smith was sheriff of Carroll County. Is that not true?